My husband and I were stunned that we were having twins, but nothing could have prepared us for Thomas and Colin’s early birth at 24 weeks, 6 days. My placenta ruptured and the boys arrived unprepared to come into the world. One had a stage 3 brain bleed on his left side. The other had an inguinal hernia. Both were on the ventilator for over a month and needed to have PDA Ligation surgery at 5 days old. There were PICC lines, blood transfusions, … so much for such small human beings to endure. We were told that they might not make it or if they did, they could have cerebral palsy or severe developmental issues. beanies that read “I am a miracle!”, a bracelet and a few more items designed to help us see we weren’t alone. That care package affected me greatly. Suddenly I knew that someone has gone through this and understands. The package gave us hope. Thomas left the NICU after 161 days. Colin was discharged shortly after at 165 days. Leaving the NICU with both boys was wonderful but also daunting. We finally started our life as a family, but it was hard because we were leaving our surrogate NICU family. It took so long to stop hearing beeps and alarms in my head but eventually we settled into life at home. A few months later, the boys started physical therapy and occupational therapy. Speech therapy started around 22 months. They continued with this until they were 3 years old when they graduated out of needing OT and PT. It was during this time that I decided that no other preemie and micro parents at UCLA Santa Monica would go through the NICU feeling alone. I became a NICU Ambassador for Graham’s Foundation and started attending NICU Parent Support group meetings to talk with preemie parents . I also did the same for my twins group, WLAPOM. I volunteered for 4 years until we moved to Northern California. Now I work for Graham’s Foundation as their NICU Outreach Coordinator, contacting hospitals across the country to make them aware of what Grahams Foundation is and how they can help parents through the NICU journey. I also provide app support for Graham’s My Preemie app. It is a wonderful tool for parents of preemies and micros to chart and journal their babies growth, feedings and accomplishments. It is available for iOS and Android and currently in English and Spanish with requests for it to be translated into more languages! Our boys are now 6 and doing great. They have overcome the odds and worst case scenarios. They are amazingly normal… running, jumping, getting into everything type kids. Yes, they have had some delays but have hit all their milestones in their own time. Their journey taught me so much about resilience, patience and strength and I’m honored to be able to share what I’ve learned with new parents of preemies. I arose from a refreshing afternoon siesta with a knock on the door. As I lifted my head from the luxury overfilled hotel pillows, my eye was caught by the graceful landing of a majestic seagull on the balcony ledge overlooking the beachfront. I pulled back the white Belgian linen duvet cover to make space on my lap for the banana pudding I had ordered and was about to indulge in with abandon. There were no limits on this vacation- besides, I was eating for two – or does it count for three with twins? What a lavish way to spend this holiday as an expectant mother. I couldn’t be more in bliss. Except that wasn’t quite how things really went. In reality, the knock came from food service. And what the cafeteria menu listed as “banana pudding” was really more like a serving of Jell-O brand instant vanilla pudding mix sans bananas and wafers. And my beachfront balcony view was actually a ledge outside the window blocking the sight of some construction project down below. Yes, it was still a holiday. And I was still doubly blessed in pregnancy. But I was not celebrating through an indulgent pampering baby moon. Instead, I was spending my holiday in a hospital. I originally started writing this reflection on Day 13 of pregnancy hospital bedrest, 10 days after my water broke, and 7 days before my twins were born via emergency C-section at 28 weeks. I am sharing it to encourage other mothers whose pregnancies aren’t going as planned and who may be filled with uncertainty about their upcoming delivery and prognosis of their unborn child(ren). I am especially reaching out to those expectant mothers who won’t be celebrating the upcoming holidays surrounded by family and friends in the comfort of a home or restaurant; but instead will be inside four white walls hooked to an IV in their arm. As you can imagine, being in a hospital was not where I had initially desired or planned to be. As a first-time mother, there were a million other ways I originally could have envisioned myself preparing for the upcoming arrival of my two little ones. I could have been out shopping for coordinating Koala Baby outfits at Babies R Us, so my eyes could gleam over how adorable my babies will look. Or I could have been at home choosing an aesthetically appealing arrangement for my babies’ nursery; carefully picking out colors psychology has pre-determined to impact the amount of crying and sleep a baby does and scrutinizing over the minutiae of interior design to get the perfect image to flaunt on social media. Or I could have been mid-pose, suspended in elegance, while the beauty of my shape and pregnancy glow were being illuminated in meticulously captured maternity photos to create a gorgeous keepsake to cherish from this time of enchanted anticipation. (the only available background option being a hospital mirror selfie didn’t quite match the caliber of the scenic backdrop from my imagined maternity photoshoot…and due to ongoing HG (Hyperemesis Gravidarum aka severe morning sickness- or in my case all day sickness) and the PPROM (Preterm Premature Rupture of Membranes aka water breaking), I didn’t make it far enough in my pregnancy to sport a round belly ready to bust at the seams, and what small roundness I did have deflated into more of an actually bumpy bump). Instead, my holiday celebration turned into staring at the skinny second hand circle the clock one more time. Counting how long the sunlight filled the room when a cloud let the brightness through. Catching snippets of muffled conversation outside my door and trying to picture in my head what the person whose voice I could hear looked like. It meant waiting. Lots of waiting. And, as excruciatingly boring at it was, hoping and longing for more waiting. Because it was no longer about me, my wants, or my comfort. It was about making sure that the little two-pound people inside me got more time to practice breathing and regulating their own body temperature. It was about getting through another 24 hours, because my high-risk doctor told me that each day added 3% to my babies’ chances for survival. It was about helping them put on body fat and develop their immune systems. It was about doing what they need. And not what they need so I can throw it back in their faces when they’re older about how much I went through for them and how grateful they should be. Doing what they need so they have a fighting chance at life. Doing what they need so they can come out of me and properly experience everything that is good and beautiful in the world. Doing what they need so when they bring me smeared handprints on a ripped piece of construction paper and say, “Happy Holidays!”, that paper is worth more than anything they possibly could’ve bought at the store because those little hands are attached to little pieces of my soul. This year was no exception. The event, powered by Pampers and supported in part by Dr. Brown’s Medical, was held on Nov. 7 in Manhattan’s Upper Story by Charlie Palmer. We were joined by many supporters, healthcare professionals, friends, and family as we proudly recognized Dr. Richard A. Polin as this year’s Graham’s Foundation Honoree. Throughout the evening, guests dined on delights including wild mushroom croques madame, duck cigars with a port wine-cherry dipping sauce, charred beef tenderloin, Gruyere-Brioche croutons, and more. Signature martini concoctions sponsored by longtime supporter Tito’s Handmade Vodka included a French 75, a Lychee and Rose Petal Martini, and our signature Graham’s Blue Martini. Every preemie parent has a story. Here at Graham’s Foundation, we’re all about parents supporting parents. Over the next several weeks, we’ll be sharing some of our own team members and volunteers personal prematurity journeys. These are stories of frightening beginnings and incredible triumph. We find so much beauty in each story. I always say that my pregnancy was super easy, until one day, it wasn’t. At 24 weeks, our diagnosis was IUGR (intrauterine growth restriction) from placental insufficiency, which meant my placenta wasn’t giving my baby what was needed in order for him to thrive and grow. At 29 weeks, the doctors made the call to admit me, and I vividly remember asking the doctor if he still thought we could make it to 37 weeks. His words sent chills down my spine. He said “I’m trying to buy you one week.” I kept thinking that this couldn’t be the way my pregnancy was going to go. Honestly, I felt ashamed. I couldn’t understand what I had done wrong. I blamed myself for it, and I still sometimes wonder if there was anything I could have done differently. My doctor did buy me exactly one week. My son was delivered via emergency c-section at 30 weeks and weighed in at 2lbs. He would spend the next 130 days in the NICU, which I can only describe as a roller coaster filled with highs and very deep lows. I found my emotions would flip flop day to day depending on the report from the doctor, which caused me to feel like an emotional wreck. While we rejoiced the day he was discharged, bringing him home had its own challenges as we had oxygen and a feeding tube. There were many tough days. However, as hard as this whole experience was, I have been able to reflect on all of the good that we experienced during and after our stay. The top one being my son who is a fighter and shows more resilience than I can accurately put into words. While our friends and family were a wonderful support, I found that sometimes I didn’t feel comfortable truly telling them about the storm we were in. At Graham’s Foundation, our sole purpose is to provide parents with that lifeline. To be the kind and gentle voice that offers support and encouragement in a parent’s most terrifying days. Please help us ensure that parents get the support and resources they need. The NICU is a lonely, frightening place. But it doesn’t always have to be that way. Donate to preemie families today. If you’d like to hear more of Jessica’s story, or connect with her directly, please email Meegan at meegan.s@grahamsfoundation.org. My hands are weakly wrapped around the wheel. My throat choked up as I’m holding back the pain inside from physically manifesting down my face. “Happier” by Marshmello & Bastille is playing on the radio. The twins are behind me securely strapped into their car seats. Imagining the seeds of resentment planted in them by a day that I ruined. Potential joy that I robbed. It just so happens to be World Prematurity Day. I am a preemie mama, and I’m here to share my story about post NICU trauma. This past November 17th marked another annual reminder of the many babies born too soon through World Prematurity Day. Unrelated to this day’s cause of a call to awareness for this medical tribulation, my family was invited to participate in a local charitable event for less fortunate members of the community to receive a meal and take home food donations and commodities. As a single mother of twins, any outing we undertake has its logistical challenges. Unique to us, however, is the additional compounding factor of it currently being RSV season. Although this is my twins’ second winter, I have made the choice to continue to err on the side of caution and once again remain in semi isolation during the winter and early spring months. This means no large crowds and avoiding most indoor events and stores. You see, although my twins appear healthy and happy on the outside, the fact is they were still born 12 weeks too soon. This means they entered the world before receiving necessary infection-fighting antibodies and have vulnerable lungs compared to their peers. At even greater risk is my son, whose water broke at 26 weeks, stunting lung development even before his birth. During his first couple of weeks in the NICU, he remained on critically ill status while fighting to overcome sepsis, respiratory distress syndrome, pulmonary hypertension, and a large PDA. And, while their known risk status makes them eligible for the monthly Synagis injection (a preventative shot against RSV) doses all winter, even the drug’s information website itself clearly states- “Children can still get severe RSV disease despite receiving SYNAGIS” (https://www.synagis.com/patients/what-is-synagis.html?fbclid=IwAR3pyRTWHfv93XFzwgaFJ5R8kh5gqi7rwdG6etEk7gNzMcs52cMo41rMo3w). I had originally hoped that since this particular occasion was limited to invite only that it may be a small somewhat manageable gathering for us, but as I pulled into the parking lot that did not appear to be the case. To make matters worse, as I opened my driver side door, I was immediately greeted by a former NICU mama’s most dreaded sound- a hacking cough nearby. I was then directed by a parking lot greeter to the first building for registration and breakfast and my heart sunk as I saw how full and enclosed the space was. Struggling to trudge the twins’ frame stroller through the parking lot gravel, I disappointingly let go of the thought of being treated to a meal I didn’t have to prepare myself while sitting down for a minute to get a break and relax. After finally arriving at the door, I asked another event volunteer if it was possible to skip the meal and just pick up the donation box but was told I still needed to enter to register. Fear crept up my neck as I entered in and joined a long enough line to know there would be a significant wait. I tried to save myself more sorrow by keeping my eyes away from the buffet style breakfast spread that I would be missing out on. As soon as we stopped moving and my little ones realized we had arrived at our destination, they immediately decided it was time to get out of the uncomfortable infant carriers and play. They both started whining and arching their backs to push out of the straps. On cue, both the presence of babies in general and that they’re twins drew attention from those around us. Within seconds I was surrounded by outstretched arms of strangers leaning forward into the seats and offering their assistance. Everything started to become a blur for me. All I could hear over the sound of my heart beating faster as I impatiently willed the line of people to dissipate was the phantom beeping of the cardiopulmonary monitor. Was this another desat? Did a wire just get loose again? Where is the nurse? I started singing “Twinkle Twinkle Little Star” to settle the twins, but they were adamant to get out and on the go. The women around me kept insisting on lending a hand and I could hear their frustration with my dismissal mounting – “I can take one- if you’ll let me help you”. I tried not to make eye contact to minimize my shame. “I got it,” I muttered in no particular direction. No, I’m already on my way there. Of course, I wanted the kind strangers to help. Of course, I want to enjoy the rare treat of a prepared meal. Of course, I wanted to take my children to the play area and inflatables in the other building and let them have fun. Get their energy out. Be kids. Get gawked at and ooo’d over for being twins and little and cute. Be normal. But instead this is our reality. Having to ask if an event will be indoors. How many people will be there. Being accused of being a “germaphobe” even by friends and loved ones. Especially by friends and loved ones. Having people avoid visiting us because they’re uncertain about the ‘requirements’ to visit. Deciding it isn’t worth the fuss and leaving us abandoned instead. Feeling isolated, misunderstood, burdened. Alone. Everyone says germs are “good for you”. That your baby needs to build an immune system before they get to school. But not everyone has seen their baby in the hospital for months. Poked and prodded daily. Prongs in their nose, wires stuck on their body, mouth covered by tape and a tube down their throat. Uncertain if they will even come home. If today is the day they will take a turn for the worse. I exited the driver side door and approached the side door expecting the worst. But there was no spite or resentment. As I pulled the first door open, I was met with my son’s usual wide cheesy grin. My daughter was peacefully asleep. The moment had passed for my toddlers’ short attention span. We were home. Safe. Healthy. Our whole family together. No longer separated by one twin being left at the hospital while I took the other home first. Would they for sure have gotten sick had we stayed? Maybe, maybe not. Is it worth the risk? For our family, not yet. I am a former NICU mama. And I am still dealing with post-NICU trauma. For my family, prematurity awareness is not just one day- is it year-round. Valerie Frost is a mother, scholar, and lifelong learning enthusiast. A Garden State native, she is a former Kindergarten teacher now tackling Stay-at-Home Mom life with single parenting of boy/girl premature twins. She recently completed her M.Ed. and has a passion for creativity, health, and personal well-being. Everyone has a day that changes them. A day that never fades from memory. May 3rd, 2010, is that day for me. Before May 3rd, I was an excited, first-time expectant mother—doing mom things, picking out crib sheets and relishing those first faint kicks of my long-awaited little one. I couldn’t wait for August 11th, my due date. Unexplained, unstoppable labor changed everything. My baby was coming and he was coming fast. I delivered my son by emergency C-section. I had no idea what happened. What could I have done differently? The guilt ate at me for weeks as I watched our tiny two pound miracle fight in his isolette. The next several months brought many amazing highs and frightening lows. Our son showed more strength that I knew one person could possess. 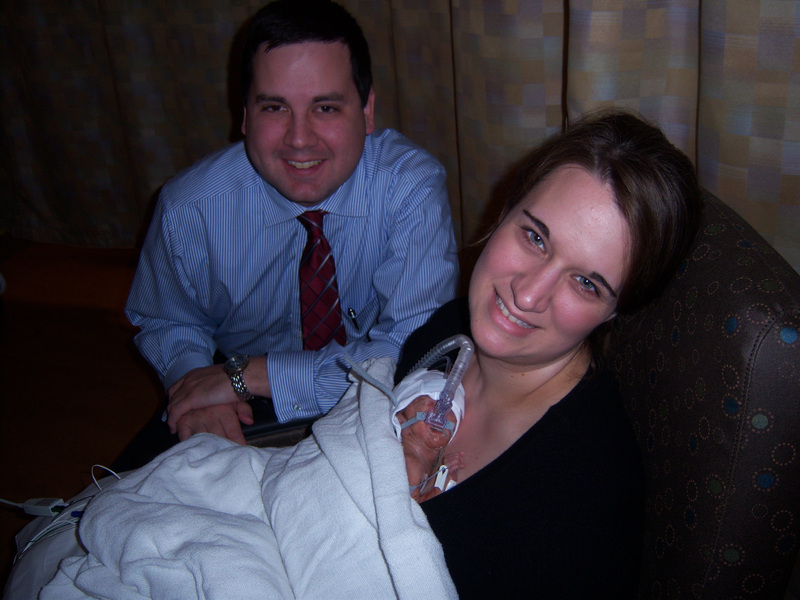 After we brought him home, I had time to reflect on our NICU journey. Despite the hurdles my amazing baby had overcome, I was still struggling. Was it normal to hate my body for failing its most important job? Was it normal to cry every time I saw a happy pregnant woman with her hand laying across her round tummy? Why couldn’t anyone help me understand that it was okay to feel the way I felt? There was no one around to offer me a lifeline. No one to say that these feelings of loss, guilt and breathlessness would eventually ease. I don’t want any other parent to feel the way I did those months after May 3rd. At Graham’s Foundation, our sole purpose is to provide parents with that lifeline. To be the kind and gentle voice that offers support and encouragement in a parent’s most terrifying days. Today is Giving Tuesday. Please help us ensure that parents get the support and resources they need. The NICU is a lonely, frightening place. But it doesn’t always have to be that way. Today’s post comes from our preemie parent mentor Jennifer. To connect with her or with another one of our mentors, click here. After enjoying the 10th birthday of my beautiful niece Kristal, I started to feel some discomfort. I was in the bathroom every 5 minutes. At about 3 am I starting to feel some pain, I remember I told my mom. But, I said in my mind “I’m pregnant so I’m not going to play with pain in my tummy” so I decided to go to the hospital with my dad. We arrived at 4 and in less than 10 minutes I was in the area of Labor and delivery. I laid in bed, they put on the straps and the nurse left for a moment and that’s when the adventure began. “It broke, the water is broke,” I yell to my dad. Just remember that the doctor, who attended to me, said the day that your water breaks is going to be a lot. Then the pain started or rather the famous contractions. OMG that pain … they checked and I was 2 centimeters dilated. They only thing that I was thinking was that I was only 25 weeks pregnant. They began trying to stop the contractions, but the pain was still there. Even with serums, a drug, I was still feeling contractions. Boom!!! They came back and checked and now I was dilated 9 cm. Thank God my mom arrived. I decide to get the famous epidural just thinking if one of my babies doesn’t get in the position they have to do a C-section. They dress Mommy and take me to a room with a window, fast food style. They were two doctors and four nurses plus the ones in the window. The time to push began. I remember every nurse telling me to push like I want to poop and in my mind I was like “hello I don’t want to poop”. I don’t remember for how much time I pushed him, but at 12:19 Mateo came. I didn’t see him; they passed him through the window very fast. Lucas’ water had not broken yet, so the doctor did it and in one push he came at 12:25. At least I could see him as the belly had dropped something, but as he came they took him away through the window to the NICU (neonatal intensive care unit). I just remember that my mom told me that Mateo had to receive CPR (she saw a little bit through the window). For me what I understood was that he was born dead. As I entered the NICU, I encountered a scene that no mother would like to see but despite everything I did not lose faith. Baby A and B, tucked into incubators, tubing, filled with cables through the nose, mouth, skin, miniature babies, machines everywhere, wrapped in wire, but alive. But regardless of that, I just wanted hold them, kiss them and tell them I was happy to see them. . Wow, it was the most beautiful moment watching his miniature hands gently grabbing my finger. It was great. During this pregnancy I realized that the love God has for us is so great that we cannot compare with a mother’s love or any other love. Each passing day of my pregnancy I felt the love of God. September 12 was day filled with many emotions. And here is when my NICU Story began. Horrible, horrible, horrible. That was the most difficult decision that I had to make in my 29 years of life. I didn’t choose anything that day, the first choice felt like I was killing my son, the second was the only one that I was a little convincing, and I still don’t know what the third means. So after a conversation with God and asking him for the right decision, we decided for the second option and they said that when his heart rate started to drop they would call me. So now you know where the PTSD with hospital phone calls started. Friday the 20th at 3 am I received the call. I ran to the hospital, literally. And the first thing that I did was look at the monitor. His heart rate was at 77, and the nurse asked me if I wanted to hold him. Hello!!! Of course I wanted to hold my baby. When they put my baby in my arms I looked the monitor and his heart rate was at 125. That day my heart stopped 125 times. For 5 hours I was with him, telling him that I love him and he would be going from my arms to Jesus’ arms. I told him to go in peace and enjoy this time like I was enjoying it. And like I said, five hours later he passed. This is only the first week in the NICU. After all, my NICU life continued. Walking to the room with Lucas’ empty incubator beside Mateo’s was hard but I had to be there for him. Mateo is the strongest boy that I ever met. Our first kangaroo care was when he was one month old and lasted 45 minutes and the next day they had to put him in the oxilator (high frequency ventilator). He was on this ventilator for 2 months. I spent Thanksgiving Day in the waiting room of the OR because he was in his first laser surgery (he had another one in December). Between codes and blood transfusions, they found out he has pulmonary hypertension. They tried to extubate him a couple of times couldn’t so they had to place the tracheostomy. They surgery was on January 16th (my youngest niece’s birthday). Because his liver was enlarged they had to open his belly, which turned it into a major surgery. The day after surgery he recovered so slowly that they didn’t thing he would make it. Back to central lines, IV’s, Nitric oxide, and 100% oxygen. But like I mentioned before, the God that I serve is bigger than any thing in this world. I was praying every day; I was reading the Bible to him every day. I believe in God and His Power. I took things day by day. There where rough days, but I always said to God “If you chose me, you will give me the strength that I need”. I remember he started having blue spells while on 100% O2, and when he was having this spells I thought that he didn’t have much further to go. I went home (to the Ronald McDonald house) and prayed that night that he would be on 70% O2 the next day. I will tell you keep praying because when I arrived at his room he was on 78% O2. Praise the Lord! So that’s been my life. He started to become more stable and they tried to put him on a home vent, but he failed. Mateo was the only 9-pound trached baby in the NICU, so we started to think about putting him in the PICU. We had the first meeting and I remember this Doctor asking me what my expectations were for my son, a question to which every person should know the answer. My reply was “get better and go home.” His response, which will never leave my mind, was “ I just want you to know that I don’t have magic for your son”. Excuse me, Sir, but the God that I believe in doesn’t use magic. Anyway, two months later I went to the PICU. After spending 11 months in the NICU, I had created a family there. I spent two weeks in the PICU because coded while on a home vent trial. 5 days after that code I was transferred to the Children’s Hospital of Philadelphia (CHOP). I got there on Friday. Sunday he was in the OR for a stent placement and a biopsy. I celebrated his first birthday in the PICU with my husband and nurses and a couple of new friends that I met along the way. They moved us to the PCU (progressive care unit) to start the process of training to be able to go home. On November 19th, two months of training later, we went home. After 432 days total, we went home on a vent that he could tolerate. You think that when you go home everything will change, but I can tell you that not much has changed. You worry more but you feel happy at the same time. I would have never known that with all the training that I received I would have to use the CPR on my son a month after discharge. A mucus plug formed in his trach, but when the paramedics arrived, he had already recovered and was going back to normal. We spent a couple of days in the hospital after this, but my son was fine. Halleluiah. We had a couple of more hospital visits after this, and so we created our own routine for coming and going. Even though I have a 19-month-old baby that doesn’t crawl, talk, walk, or sit, I feel more than blessed than ever. So my son has a life support machine, tubes and limitations. Who calls these things limitations? I feel more than blessed to have him in my life, to show me the love of God every single day. Mom and Dad, don’t give up even if the path looks different and rough. God is still the same God who divides a whole ocean. He’s the one who came back to life to save you and show you how great He is. Sometimes we have to sacrifice for our kids, but to see them grow and smile at you makes you stronger every day. It’s just over 3 and a half years since we started our journey with prematurity and damn it I wish I knew back then just how much it would become a part of me. Of us. I don’t know why I thought it would be different. Maybe I thought it would be over once we left the hospital. Or once we got that tube out. Or once we managed to survive all of the firsts. Maybe I thought that the effects would decrease over time, that the memories would fade and be forgotten in all of the mayhem of life, family, work and fun. Maybe I just thought that time would heal, because that’s what everyone says. But I really wish I knew then that none of that is true. That it actually doesn’t matter how long it’s been, it’s still raw and terrifying and painful and you just have no idea when it will pop up and smack you in the face. Prematurity – it isn’t just a word anymore. It’s me. It’s us. It runs in our veins now. It’s in the air that we breathe in our home, it’s in my cups of tea and it’s waiting to nestle close to me in bed each night. Oliver was fed with a nasogastric tube up until he was 19 months old; the effect of Prematurity was taped to his face everyday. We have roughly 25,436 flannels in our house gathered from multiple family members over time to help us manage the years of vomit. We have syringes and medications in boxes. Casts of his brother’s feet are on our wall, and next to our bed. Prematurity ripped our family apart and has also somehow become the glue that stuck it back together. Oliver won’t be a ‘preemie’ forever, he has become a kid, and he will become a teenager and an adult. But his brother won’t. Our walls are covered in photos that are beautifully full of our miracle boy, but they are also glaringly empty of his partner in crime. So prematurity will travel with our family forever, because it is synonymous with parenthood for us. It became our journey and we will travel this road forever. We missed out on so much, but this is what we have. But some days I really wish I knew how heavy that would feel. And I wish I knew that some days it would feel like a gift, a unique special journey that was just for us, and some days it would feel like a giant wall, cutting us off from everyone else while we try desperately to claw our way back through. One here on Earth, One in Heaven. Have You Checked Out Every Tiny Thing and Hello Preemie? How did your work as an RN inspire Every Tiny Thing? What need did you see that wasn’t being met? As a bedside nurse, for years I was pretty clueless about the enormity of the struggle preemie parents truly face. Parents so often put on their best face when they’re with their baby in the NICU, trying to be strong, which means the staff may not have any idea how much they’re suffering. I know I was in the dark about it until I decided to start a blog about the NICU. That’s when I started reading more online articles, participating in preemie forums and reaching out to preemie families. That’s when I started to learn more about how truly difficult it is for families. So I’ve learned more about what parents are really craving away from the bedside. Through emails and meetups, through online forums and coffee dates with friends, I’ve learned that parents feel alone, confused, under-informed and extremely stressed, regardless of the severity of prematurity. There are so many needs not being met, it’s hard to even know where to begin. I wanted to help make the NICU space feel more welcoming, because for me as a nurse it is a welcoming place, but I know for parents it isn’t. I saw parents being left out of so many fun newborn experiences, like spending time in a nursery that feels comforting, and I knew it could be helped with a little bit of creativity. So NICU Crib Art was born, and then I just kept on creating whatever new ideas I dreamed up. How did the response to Every Tiny Thing shape the development of Hello Preemie? With Every Tiny Thing, I wanted to create items that bring joy to parents. It was the outlet for my creative side, and it was about making products to comfort any parent in the NICU, not just preemie families. But the truth is that the vast majority of my customers and followers are preemie families, and the needs of preemie families are unique. So I decided to create a new site devoted 100% to preemie families through raising awareness of all the resources that are available to preemie families. #1 -“I wish I knew about that back when my baby was still in the NICU.” Whether they’re talking about a journal to write in or a support group to join, too often parents don’t know about a helpful resource until well after it would have been most helpful. So it became my mission to create a positive and inspiring place where parents can learn all about everything that’s helpful on a preemie journey in a timely manner. Whether it’s products to buy when your baby is still in the NICU, books to read, support groups to join, questions to ask, survival strategies to try, words to use when talking with friends and family… if it’s gonna help a preemie parent, I want to share it. There are a lot of resources out there – what sets Hello Preemie apart? What special role does it fill in a parent’s journey? You’re so right – there are TONS of resources out there! My goal with Hello Preemie is to inform preemie parents about all of them. 1. I am committed to focusing on the positives. Parents tend to stay off the internet when they need help with their preemie because they can’t handle the scary stories, the worst-case-scenarios, the tragic outcomes. They just want to stay in a place of positivity and hope, and I believe they deserve that. Unfortunately, their avoidance of online research is what keeps them from learning about so much of what’s available to help them. So I want to build a site where families feel safe, where they know we’re gonna stay on the positive side, sharing successes and inspiring each other. 2. I want to share everything – not just my ideas, not just products to buy, not just groups to know about, but all of it. Everything I think preemie parents will love to know about, I want to share. 3. I bring to this project my 20+ years NICU nursing experience which I think is unique and helpful in its own way. I’ve cared for thousands of babies and their parents in the NICU over my career. That breadth of experience, coupled with technical knowledge about prematurity and the workings of the NICU, plus a passion for advocating for parents allows me to bring a unique perspective to the world of helping preemies and their families. What forms of support are NICU families still not getting and why? Some hospitals are doing amazing jobs, and it’s important to keep that in mind. But it’s easy to be discouraged, because all too often parent’s aren’t getting the support they deserve. In many instances, they’re not getting included in their baby’s care as often and as early as they could be. They’re not being connected with other parents so that they have someone to talk with. They’re not being taught about PTSD, why they may suffer from it and how to get help with it. They’re not empowered to be an integral part of the team caring for their baby. They’re separated from their babies at a time when bonding and togetherness are crucial. In my opinion, it takes our American model of health care a long time to adjust to new research and new ideas, particularly when it comes to the more emotional aspects of medical care. We’ve made tremendous advances in saving babies, and ensuring they have the best long-term outcomes medically, but there’s still so much more to do to support the emotional well-being of the entire family. But it’s not all bad – things are getting better every day! There is great emphasis now on developmentally supportive care in the NICU, family centered care, skin-to-skin holding & use of breastmilk and it’s really making a positive difference. There are organizations like Graham’s Foundation and many others out there working to make it better for preemie families every day. The key is making sure parents know all these things, and that’s why I’ve started Hello Preemie – to ensure that all parents know what’s possible. Do you foresee yourself running Hello Preemie yourself for the foreseeable future or is your hope that it will grow into a project with staff and multiple initiatives? I envision running this website on my own for the foreseeable future. While I definitely need help with some aspects, such as graphic design and accounting, I am the type of person who loves to tackle new challenges, learn new things, and I’m loving the process of growing this business on a very personal level. When a parent first comes to Hello Preemie, what’s the best way for them to use the site? Most of the exciting action with Hello Preemie is on Instagram. It’s where I reach out to preemie families with a feed that is inspiring, fun and positive. It’s becoming a place where parents are supporting each other, sharing discussions and ideas. Every blog post I write is announced there, too, so it’s the best way to keep in the loop. But for everyone who’s not on Instagram, visiting the Hello Preemie website and reading through the blog posts is the next best thing. Actually, when you’re at the website, I’d definitely recommend signing up for the newsletter. I’ve found a way to deliver only the emails that are relevant to wherever you are on your preemie journey. So if you’re a parent of a preemie who is still in the NICU, you’ll receive a newsletter with information just for that. If your preemie is home from the NICU, your newsletter will be filled with useful information for that part of your journey. And for everyone else, the “friends and family” version of the newsletter offers great information for supporting parents of preemies at any stage of their journey. What will success look like for Hello Preemie? How will you know when you’re truly fulfilling your purpose? I have to say that it already feels successful because the connections I’m making on Instagram are already so inspiring. Every day, I hear from new parents with questions I love to answer, I learn new tips & tricks that I can’t wait to share. So even if Hello Preemie didn’t grow much bigger, it’s still a success in my mind. But I have big dreams for Hello Preemie, hoping to inspire and teach ever more families when they need the help. So I’m looking forward to growing my Instagram following, and possibly even partnering with companies who are relevant in the preemie world. Paid sponsorships will allow me to keep the site running and growing. But here’s the important part about that – because I am in charge here, I get to decide who I will partner with and who I won’t. I only mention products and work with brands that I feel awesome about. I’m not going to try to make a buck if it means working with companies I don’t admire and believe in. The best way I know I’m fulfilling my purpose is when I hear a preemie mom or dad reach out to say that my words have helped them. That’s what it’s all about. There is nothing better than hearing that I’ve helped someone through this tough time. Some days it’s easy to feel that it’s not enough. Hello Preemie can’t make every preemie healthy, I can’t make every journey easy, and I can’t make prematurity go away. But I try not to let that stop me from doing what I can. If I can make a family’s day a little brighter, or if I can share a bit of knowledge that helps them feel more empowered, it’s been successful. If I can help them feel a little normal, as if they have a friend who understands and is here to help, it’s been successful. If someone recommends Hello Preemie to another preemie parent, it’s been successful.